Continental and English breakfast: Breakfast is served from 08.00 am till 10:00 am on the terrace or in the breakfast room. Bar: Drinks from the honesty bar are at your disposal throughout the day to keep you refreshed. Picnic baskets: We can make you a delicious organic picknick basket to take on your daytrip. Dinner – braai: on request we organize a three course meal or braai (3 meats – fish – salad bar – dessert) for 250 rand per person (water and tea or coffee included). Swimming pool: We have a solar heated swimming pool with pool loungers and towels provided. Airport Transfer: Collection and drop off at 450 rand per transfer. 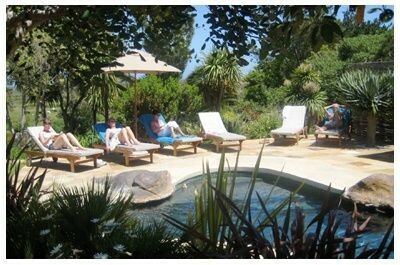 Guest House African Queen in Noordhoek, in the heart of the Cape Peninsula, became part of the WedgeView Family when Dave’s brother, Marc and his wife Marjolijn, took over this lovely guesthouse in February 2014.